The C-Lon® Tex 400 Bead Cord is a heavyweight cord with diameter of 0.9mm (just a breath under 1mm with my calipers). As its siblings, the C-Lon Bead Cord (standard weight cord), C-Lon Fine Weight Bead Cord (Tex 135) and the C-Lon Micro Cord (extra fine cord), it is a bonded 3 ply twisted multi-filament thread. 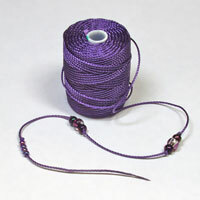 A 75 lb breaking strength should guarantee long-lasting creations for micro macrame, stringing beads and other techniques such as bead crochet, finger weaving, kumihimo, tatting as well as many other uses where a strong bonded nylon is required. The C-Lon Tex 400 Bead Cord fits through most 4mm gemstone beads, Miyuki 8/0s once with a self needle and it passes easily twice through Miyuki 6/0s. Personal Note - Many times I have wished for a cord heavier than the Nylon #18 and C-Lon Bead Cord. Until now I often made my own cord, an extra step, when needing a thicker cord. The C-Lon Tex 400 Bead Cord will provide us with new design possibilities. It knots very well for micro macrame. The thread is gorgeous by itself; it has a beautiful sheen.